Community Planning has been evolving in different parts of the world. We are glad to have invited distinguished speakers to share about various examples of community planning, and explore their relevance to Hong Kong situation. 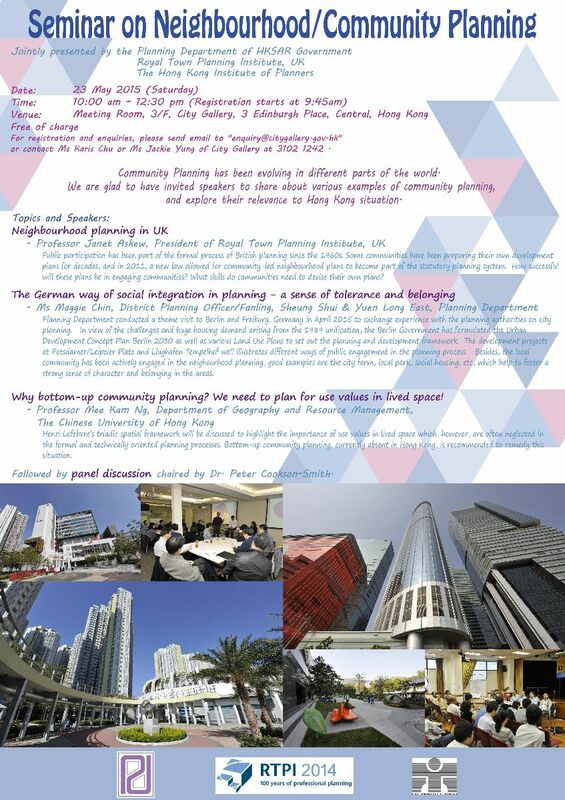 Why bottom-up community planning? We need to plan for use values in lived space! Followed by panel discussion chaired by Dr. Peter Cookson-Smith. The seminar will be conducted in English and is free of charge. For registration and enquiries, please send email to "enquiry@citygallery.gov.hk" or contact Ms Karis Chu or Ms Jackie Yung of City Gallery at 3102 1242.